N. has taken to playing in the kitchen while I work there, making meals or washing. Sometimes she simply empties cupboards, and often she demands to be up in my arms so she can "SEE? SEE? SEE?" but lately, she's also been "cooking." When I ask her what she's making, she usually says, simply, "soup." I'm not sure how she got the idea to make soup, since she's only really started talking this summer, and there hasn't been a whole lot of soup-making around here, what with the temperatures in the triple digits and all (yes, I know one can make cold soups; we tend not to). Still, it's nice to be "fed" by my toddler. I love it when kids "make soup," because they become so creative with the ingredients. "BOK-key?" N. tells me. "BEEEEn?" and then: "PAPAYAYAYA?" If I did make soup, it would be something along the lines of the food we ate at a little B&B in Nominigue (now under different ownership, I believe) when we stopped there for a night during a bike trip through the Laurentians in Canada. I've been thinking about our host Guillaume a lot lately as I've been using up CSA produce; the meals he made us were filled with produce and herbs from his garden, and inspired, he told us, by his grandmother. His chickpea salad, which I tried to recreate the other day with some chickpeas, lemon juice, fresh ground pepper, and fresh herbs, practically leapt into my mouth. I don't remember if he made tomato salad, but if he did, it would have been like the tomato, balsalmic vinegar, and fresh Parmesan dish I threw together to go with the chick peas. It's funny, but I think that those simple meals were some of the best meals I've ever eaten, anywhere. Here's to you, Guillaume. I hope you're still making wanderers feel at home. 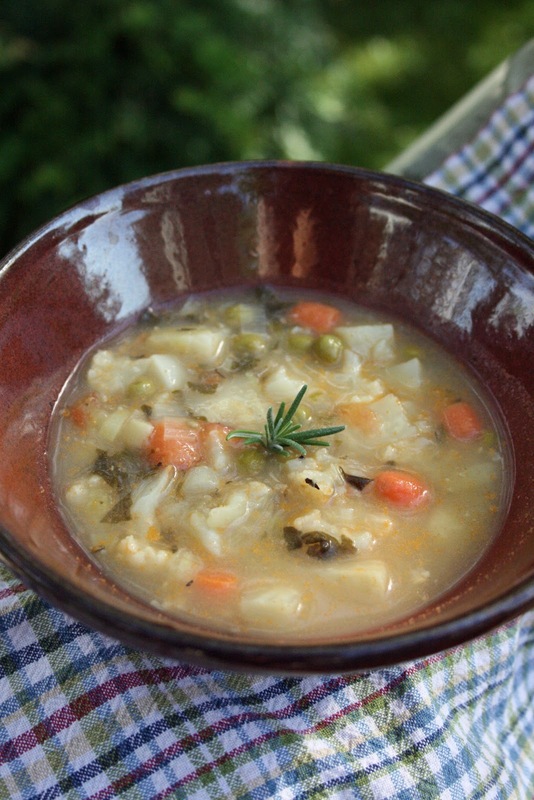 This is supposed to be a spring vegetable soup, but it could also work well with some of the summer produce arriving in a CSA share or at your local northern hemisphere farmer's market now (onions, potatoes, tomatoes, beans). Melt the butter in a soup pot and saute the vegetables (except for the tomatoes) for 1-2 minutes. Add the water, sherry, bouillon cubes, tomatoes, herbs, salt, and pepper. Cook the soup slowly, covered, over medium-low heat for about 1 hours. Stir occasionally and add more water if necessary. Let soup sit for 10 minutes. When ready to serve, add more fresh finely chopped herbs. How cute! Mine loves standing on her stool stirring a pot of water in the sink, 'Abby cooking!' Or dropping the cat food, piece by piece, into their water bowl. That soup looks so good! But with no AC in the kitchen, it'll have to wait a couple of months. My daughter loves to pretend to make things too when I am in the kitchen and to "help." Lately she is also really into pretending we are going to the circus and getting ready. As for the BlogHer shoes thing, if you love your sandals and they are comfy, awesome! Who says you need more than one pair? I learned the hard way on a trip to Vegas years ago to only wear comfy shoes. Trendy shoes that are not comfy are no longer worth the pain for me. My girls love to "help" in the kitchen and my littlest also demands to see whatever I'm cooking. They have a huge pot (that I used to boil their diapers in) and they are alway cooking nsima (the staple Malawian food) in it. I'm sorry your son is still sick - I hope he's feeling better soon and that your interview went well! Yum, I love vegetable soup. Your daughter's pronunciations sound adorable! Isn't it amazing when they start to talk and you get a whole new window into their minds? And I can clearly not go to BlogHer until I have an income and time to go shopping, because my solitary beloved pair of sandals are currently held together with a Toy-Story band-aid. Beautiful post. I can't wait until I have a little one in my kitchen. And I also can't wait until it cools down. I want a bowl of soup right now!